I started the framing last night and finished up using the materials I had easily available this morning. So, not much done, but it’s a start, right? 2×6 sill plates, reclaimed metal roofing panels as bottom of bed. That green stuff is a protective layer of special fabric to keep the metal and the untreated wood separate. Metal just loves to condense water, and I don’t want the wood laying in that, of course. I’ve had the fabric for forever, and it’s fantastic to finally get to use it. Dug out wood around the head to allow it to sit down/flush with the sill plate. I just realized I should have taken pictures of the “fancy” cutting I had to do to work around the metal supports behind the cab. I’ll try to remember to do that tomorrow. Then I ran out of 2x6s so had to stop. The next step is putting in the floor joists and rim joists. I need 7 boards for that as I’m using a 24″ OC spacing. I don’t mind a bouncy floor, if that does happen, and according to span tables, the floor will be more than sturdy enough. Until I was run off by the hot hot sun I marked off the joist spacing, so once the boards are here I can get right to placing them. Yes, I double- and triple-checked my measurements. Another thing I can do tomorrow is see if the studs in the original Tiny House are long enough to use for the floor joists. I need them to be 7′ 7″ long, so it’s a possibility. Here’s to hope! 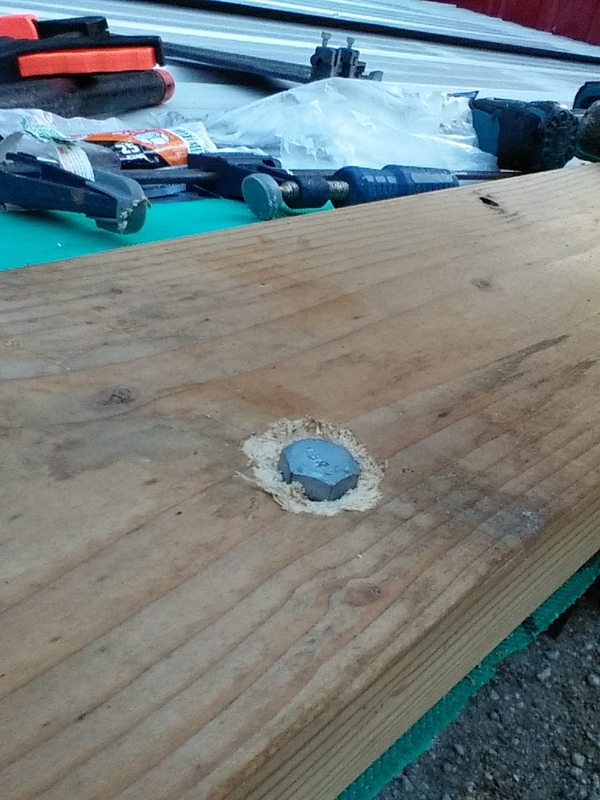 My second comment is just to save you some work: If you drill about 1/8″ deep with a bit a little larger than the bolt head then drill thru the remainder of your plate with a bit the diam of your bolt it will be a lot easier to “countersink” those bolt heads than carving as you have done. Just don’t sink them more than flush weakening the connection. Best wishes…. No worries, Richard, I appreciate input. Are you speaking of the actual “trailer” that I’ve already put work into, or the truck frame? I assume you mean the trailer frame, and I agree with you. I should have beefed it up by a LOT due to the massive amount of weight I ended up with in wood. I overbuilt. I’m not actually going to be using that space now…in fact, today I’m going to start taking the structure down. Instead I’m using my very sturdy truck to build an even tinier house on. If by chance you were referring to it, the metal frame is quite heavy-duty. 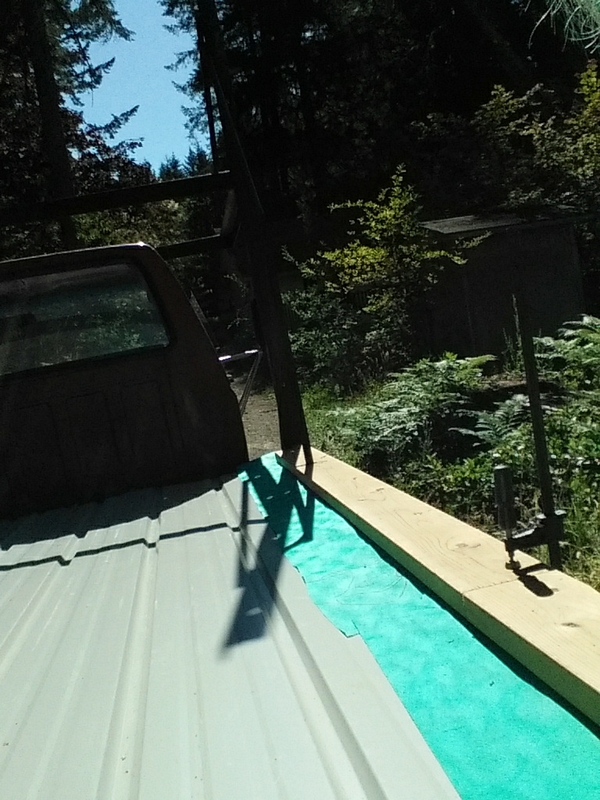 The extra metal framing I had welded on is thick, 3″ angle iron, and the truck is a dump truck base so can handle the weight of a Tiny House and more. As for your second suggestion…I have to smack myself on the forehead! Why didn’t I think of that? Such a clever and tidy idea. Thanks!